In the Ashura era, there are special mourning ceremonies called the "Czech Cheka." 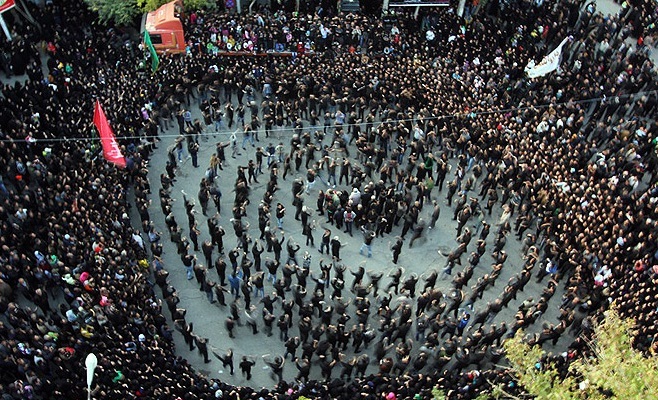 This is, in fact, a symbolic form of what happened to some of the historians' narratives in the Ashura era after the martyrdom of the servant of Azadegan and his companions It was the stone that rained the bodies of the martyrs and Khayyam of the shrine of Imam Hussein by the soldiers of Yazid. People believe that during the time of the ceremony Imam Hossein hanged himself at the gates of dinner, and the children of dinner came over at Mubarak He was stoned. Another interpretation of the ceremony was that: after all the killing and murder of the Yazid army, they hurried to the martyrs' bodies with the horse, and this reminds us of the horses of Ashqiya on the first bodies. Otherwise, the Yazid army after the martyrdom The arrival of Imam Hussein (AS) and his beloved companions were very depressed and loose. In order to prevent the Jass's spirit from dominating his soldiers, Amr Sa'ad ordered to dance and make a dance.